I’m sure that as I, and all of you, use this we’ll find more uses for it or things that can be refined or added so if you have any ideas or suggestions, please use the feedback button in the viewer 😊. “Group snoozing” first appeared in Catznip 5 years ago (and has since been picked up by Firestorm and other TPVs) but it was only ever available through the group chiclet’s context menu so it wasn’t very discoverable (or configurable aside from the debug setting). R12 adds a per-group option to always snooze group chat when you hit the little x to close group chat, and a way to configure that specific group’s snooze time-out; the “next occurrence” option simply closes the group chat session until the next time someone says something (whether it’s 5 seconds after you close it, or 5 hours) which can be useful if you run a support group for instance. 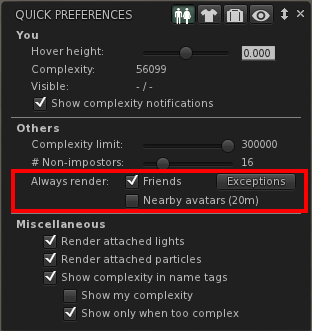 Additionally if you already have group chat open, you can always right-click the group’s chiclet and pick “Group Info” from there to get to the groups properties/profile floater or to snooze the group chat (using the default set). Finally, you’re also able to manually snooze group chat using the new chat toolbar icon; if you configured closing group chat to always snooze then you can for instance pick “Until relog” to not see group chat until you relog (or until manually reopen it). There’s recently been some griefing that involves joining busy groups only to then start mass-conferences with group members; this option will only accept conference conversations that were started by someone on your friends list. If a conference is blocked you’ll briefly see a toast and a message will be logged to nearby chat. 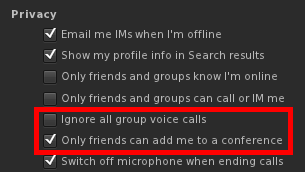 Additionally, I also provided an option to auto-ignore all group voice calls (note that this doesn’t block voice conferences from friends or non-friends). 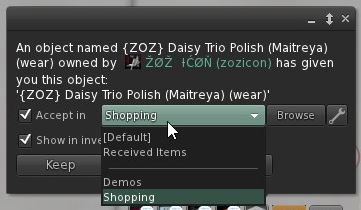 Catznip’s version of “quick preferences” was added in R11; R12 adds some minor functionality and enables the mysterious “quick inventory” tab. We all keep several HUDs attached in order to get to them quickly if we need to (i.e. mesh body/head HUD, or a hugger/dance/posing HUD) or worse, things we only need ever so often and if you’re like me, you’ll hate hunting them down in inventory because it feels clumsy and interrupt getting dressed. 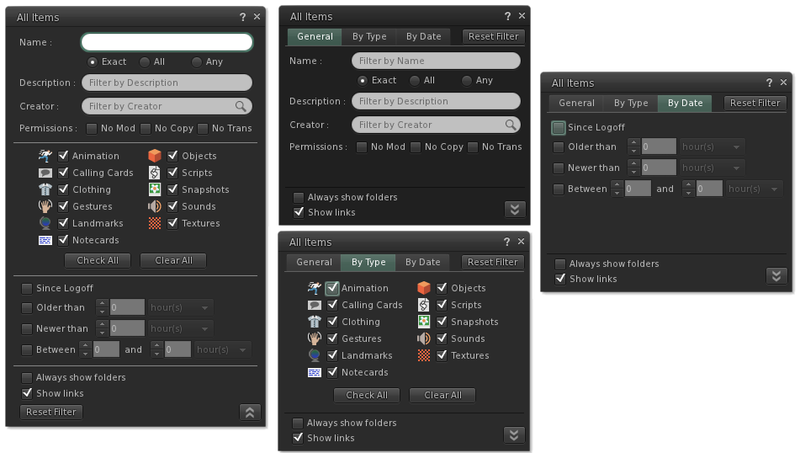 First you create a folder anywhere in your inventory, named anything you like (you might even already have such a folder at the ready) and fill it with links (or copies) to items you frequently need or, as you can tell from my example, you can put links to any existing outfits you might have. 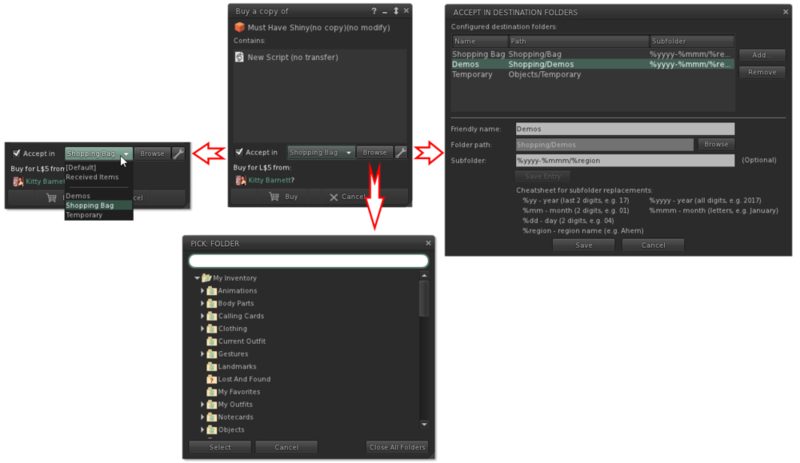 Once the folder is set up, click the button on the quick inventory tab and you’ll get the floater that lets you navigate to the folder you just created. Additionally, there’s a mini search bar to help you filter down.